chicken coops, at the El Fundo training center. This interesting and creative association demonstrates a means of providing a plentiful supply of healthy nutrition. 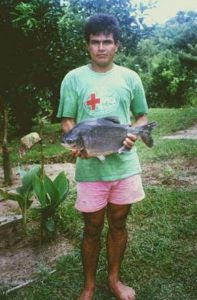 Purpose: To educate the villagers on how to assure a sustainable supply of healthy nutrition by using turtles, fish, and chickens in coordinated fashion. This will also help to restore the endangered river turtles of the region. 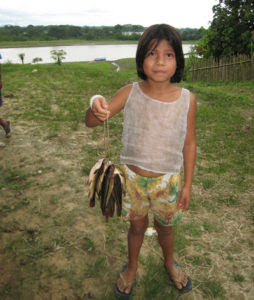 source of dietary protein and dietary fat for the local people. Over-fishing, over-population, pollution, predators, etc., have considerably reduced this natural resource. Farm chickens are common in the area, and they too provide a useful source of dietary protein. 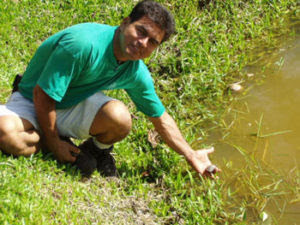 APECA maintains a pond at El Fundo, which demonstrates to villagers how they can us their chickens to assist in growing turtles. 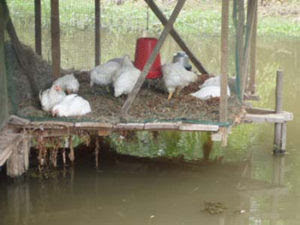 A chicken coup is built on stilts over the pond so their droppings can help feed the turtles.